Plaimor Paradise is our premium, "private resort" which we share with nice people who love relaxing in the Desert and appreciate an artistic flair. 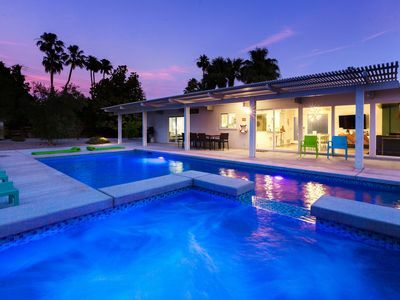 This fully restored Mid-Century modern "Alexander" vacation home features a stunning pool, spa, outdoor fire pit, huge beautiful yard, mountain view and modern furnishings. Families are welcome. 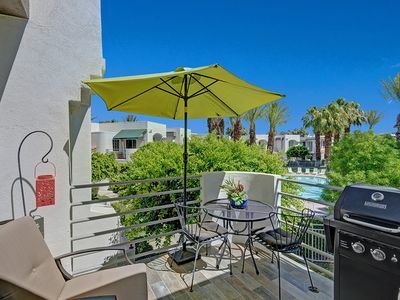 Located in Palm Springs' historic, midcentury Sunmor neighborhood, you'll feel like you have escaped to a private, "play-more" paradise. PS ID 3280. One of our recent guests summarized Plaimor Paradise perfectly, as a "private resort." 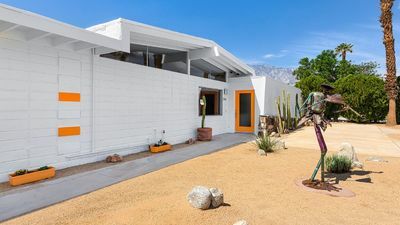 What's more, our historic mid-century "Alexander" was designed by William Krisel, and was featured during 2018 Modernism week. We furnished our vacation house with love, and we did it in a way that you will love too. Remember, WE stay here frequently, and insist on a first-rate experience for ourselves and our guests. For starters, we have a beautiful salt water pool and spa. We also include a couple of pool floats. Then of course there is the fire pit, where you will probably hang out at far more than you imagined. The well lit, open floor plan, modern kitchen includes quartz countertops, a Keurig, coffee maker, garbage disposal, adjoining bar chairs and stainless steel appliances. It is extremely well equipped, with all the cooking utensils you need. We furnished the house largely with Crate and Barrel midcentury modern furniture (NOT Costco) and relevant art. The mattresses are high-end Beauty Rest and very comfortable. We also included fun items like a bar cart, Princess phone, a 1958 replica Stratocaster guitar, Wii, family board games and kitsch items like a bulldog cookie jar and pig bookends. People tell us they love the polished concrete floors. Clock radios are fun and Bluetooth compatible. For entertainment, we went high-end with a Sony 55" 4K smart TV, Apple TV and a Sonos sound bar and subwoofer. We even included wifi connected 32" smart TVs in all 3 bedrooms. Check out the photos and contact us to reserve your stay! You have complete access to our private paradise, with the exception of the owner's closet and two on-property storage units. We will provide you a custom lock code for the house. Because Plaimor Paradise is a house and not a hotel, our cleaning crew requires time to do the fantastic job they do. 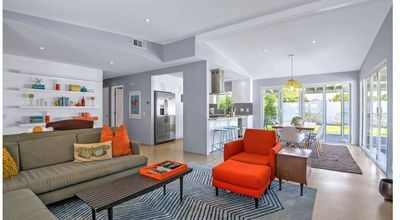 What's more, because the property is extremely popular, it often books back to back to back. Therefore, check in is at 3 pm, and check out is at 10 am. If you would like to request an early check in or late check out, let us know in advance and we will do what we can to help. Sometimes we can give you an extra hour without cost, or allow you to check in at 10 or check out at 3 for an extra $199. Please note, however, that during the busier seasons we oftentimes cannot accommodate these special requests. As we said above, we are willing to share our premium vacation house with nice people who will treat it as they would their own. I am sure you'd feel the same way too. So, please help us by telling us a little about yourself and your guests, including ages, how many men and/or women, why you are coming to Palm Springs, day jobs, interests, etc. Note, we can only accept requests from people who provide us the information required by the City of Palm Springs. We are very transparent about our background and house, we would like our guests to do the same. Thanks in advance on that. Also, a special note to spouses who are charged with finding the perfect family vacation getaway. I (Clara) totally understand! When I am looking for an AirBnB or resort for our family, I work really hard to find the PERFECT place. We did everything possible to make this property live up to our own very high standards. Rest assured, you and your family will love it. ***** "WALTER from Belgium Great place to relax with lots of character. Bright and spacious on the inside, large garden and great pool outside. After spending two weeks on the road it was exactly what we needed." ***** KRISTIN from San Francisco "There are simply not enough words to describe our stay at Clara and Stewart's -- it was perfect. 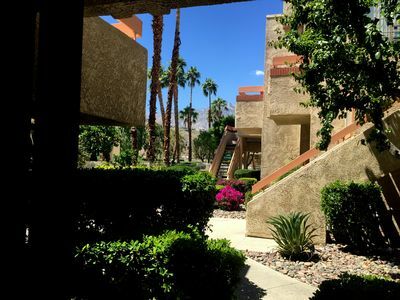 This was our first trip to Palm Springs and it exceeded our expectations. The home itself is calming and comfortable, with all the amenities you could need, and the pool/backyard is the shining star. We lived outside, despite the 90+ degree heat. The neighborhood is so soothing, and I personally took advantage of the quiet streets and beautiful setting for some early morning runs. Every detail was laid out, from how to work various remotes to endless possibilities for where to eat. 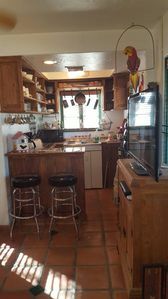 We did some cooking during our stay and the kitchen is well stocked and roomy. 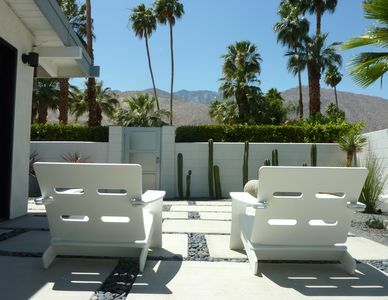 I absolutely cannot wait to return to Palm Springs and this place will remain at the top of my Wish List! Thank you for sharing your home with us!" ***** TIEN from New York "The hosts were very accommodating and great with communication (quick responses). The home is beautiful as featured in the photos. The whole entire process with booking and checking-in was very easy. Our family had the best time connecting and relaxing during our stay! We hope to visit again soon!" 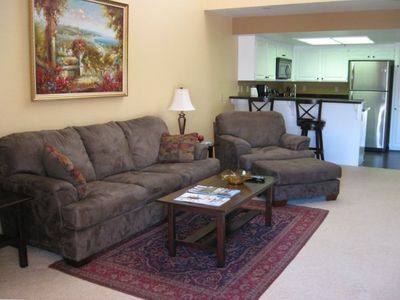 ***** CARMEN from Ventura "We are so happy we could enjoy a girls weekend at Plaimor Paradise! 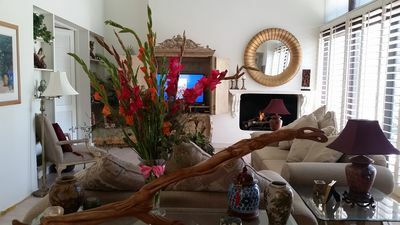 The house is even lovelier than it appears and is beautifully and thoughtfully equipped to cater to every need. Our group was comprised of 6 girls and sharing the bedrooms, bathrooms, kitchen and living areas was easy and seamless. 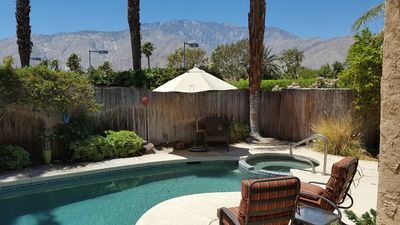 The pool and Jacuzzi are gorgeous and were wonderful gathering areas as there is plenty of room to relax in the sun and shade or to gaze at the evening stars. The property location is perfect -- it's a quiet neighborhood, private, and tucked away on an enormous lot. Everything is centrally located and places that were of interest to us were 2 miles away (or less) and took 8 minutes at most to arrive. We made good use of the kitchen and ventured out to El Jefe for Taco Thursday, Ace Hotel's Feel Good Spa on Friday, Chi Chi's for Saturday brunch and take-out from Blaze Pizza for a Saturday night in. Clara and Stewart were extremely responsive and helpful throughout the rental process. It is clear this is a special property and home -- we're so grateful we could stay for a fun and memorable long weekend." ***** LEIGHLAH from UK. "This place was incredible. 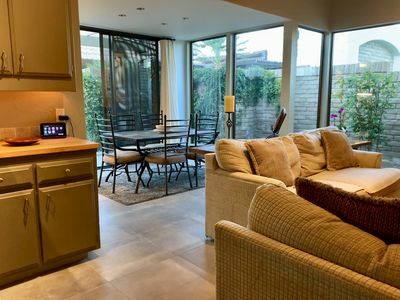 Gorgeous, stylish place with everything you need for an enjoyable and comfortable stay - best vacation rental we’ve stayed at and really hope to return!" NOW TO THE BUSINESS PART.. 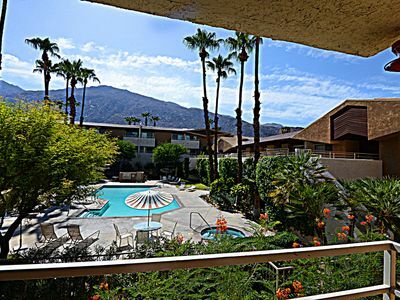 The city of Palm Springs levies an 11.5% occupancy tax to all vacation rental stays for less than 28 days. Our maximum number of days is 30. 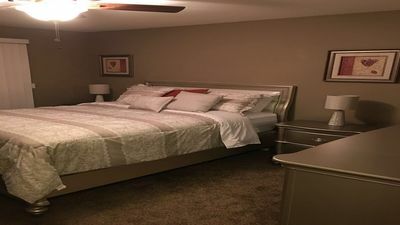 Also, there is a $50 per night pool heating fee up to a maximum of $300 (except June through September) that we will request separately, upon booking. Dogs, if accepted, require a one-time $20 extra cleaning reimbursement. We will also send you a (city required) rental agreement to confirm the booking, relevant city statutes, house rules and all the details. Also, while our minimum stay is typically 3 days, we require at least 5 days for special holidays like Thanksgiving, Christmas and New Years. To confirm your reservation, you'll need to 1. Accept payment terms and dates, 2. . Provide proper identification and, 3. Approve the rental agreement. We will make things easy for you by helping you through the process. 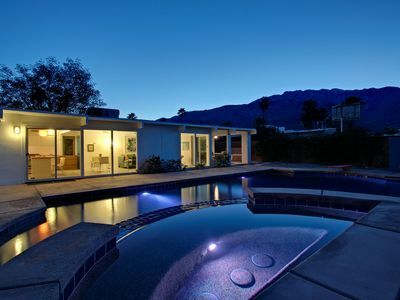 Classic Mid Century Palm Springs Oasis! 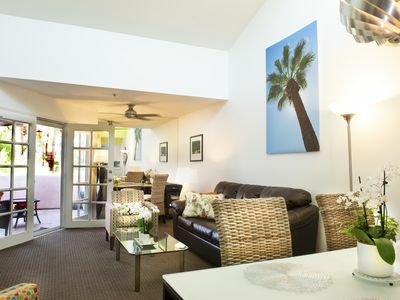 Luxury Fit-Out at The Deauville in Downtown Palm Springs. It's a Happy Place. 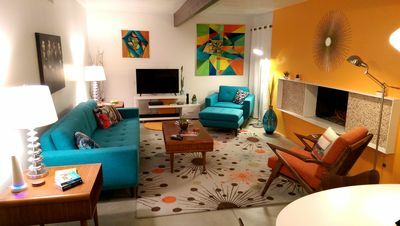 A Mid-Century Modern Alexander Home Oasis (100% New Furnishings & Decor). 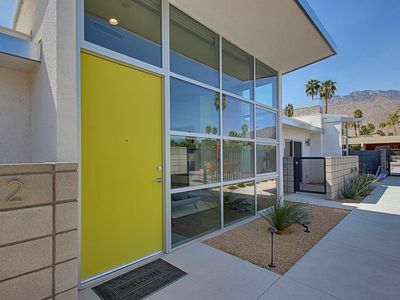 Stunning Mid-Century Inspired Condo with a twist! 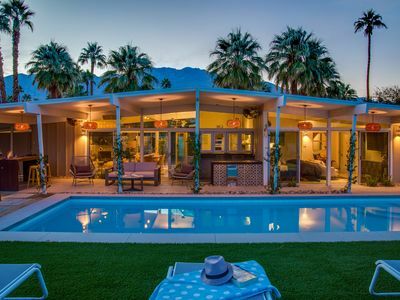 Guest House - Very Private in Old Palm Springs! NOW AVAILABLE AT DISCOUNTED RATES FOR THE SUMMER!